The construction of the new Apple store by the riverfront in Chicago has been underway for some time now. Designed by London firm Foster+Partners, the new store is nothing short of an innovative architectural decision. The store’s shape and looks remind of a Macbook, due to the metallic roof and the lid-shaped profile; but a large white Apple logo that construction workers rolled on top of the roof yesterday, erased any doubt of whether the finished building will resemble an Apple laptop. 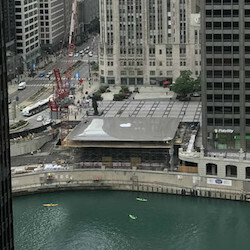 Apple is moving its store from 679 N. Michigan Ave. to its new location that stretches from Pioneer Court to the north bank of the Chicago River. "Our store on North Michigan Avenue has welcomed more than 23 million customers since it opened in 2003 and we're now creating something even more remarkable for Chicago," said Nick Leahy, a spokesman for Apple. Renderings by the UK design agency, released two years ago, revealed a futuristic glass-box-shaped design. The massive Apple logo that was rolled on top of the roof yesterday was later taken off, but photographers did manage to snap a few shots of the store’s top. Apple and Mr Leahy have not shared any info in relation to a possible opening date of the new store. Looks kinda weird, but I will take a look in person when it opens. Been there last October but haven't visited the store. The roof is a funny thing to see though. Perhaps I'll see it this year. iRoof...I wonder who is going to rip this off. I think this is fake, I can see the roof from work and there is no logo. So this area where Apple is gonna move the store is called Cityfront. Its home to WGN, use to be home to Tribune, Wrigley and others. Trump is a block away and other names are nearby too. The location is crowded though and now its really gonna be. I don't know why they are moving from where they were about 4 blocks up the street. But Microsoft has a store across the street and down the block. There is a Verizon and ATT tech stores. Its a cool spot. Watching the construction has been interesting.